All CouncilConnect websites are powered by our very own Spark CMS, Content Managed Simply! The CMS has been custom built by our web developers based on feedback from our clients, ensuring an easy to use platform that's been designed in consultation with the end user in mind. Over 500 websites have been deployed using Spark CMS to date. Over 100 of these sites are dedicated to local government authorities in Western Australia. The inbuilt workflow engine handles all your content updates and allows administrators to track updates across the entire website. By forcing content to be approved prior to being published, the workflow engine saves any incorrect information being published and ensures the proper approval process is followed. Your administrators will have the freedom to create and edit templates via HTML and CSS with the template manager. The template manager gives you complete control on the website templates. Content channel widgets allow your administrators to edit content within a website template that isn’t part of the normal content area such as the header/side/footer of a website. When you become a CouncilConnect subscriber, not only will you benefit from exclusive pricing and support, but also the automatic upgrades to Spark CMS. To ensure the CMS offers the most modern user experience and workflow efficiencies, we constantly put the CMS under review to see how we can advance the platform. It’s part of our ongoing commitment to the CouncilConnect initiative. Interested in a live demonstration of Spark CMS? Contact us for a demonstration today! Every new CouncilConnect website receives the following modules and features. 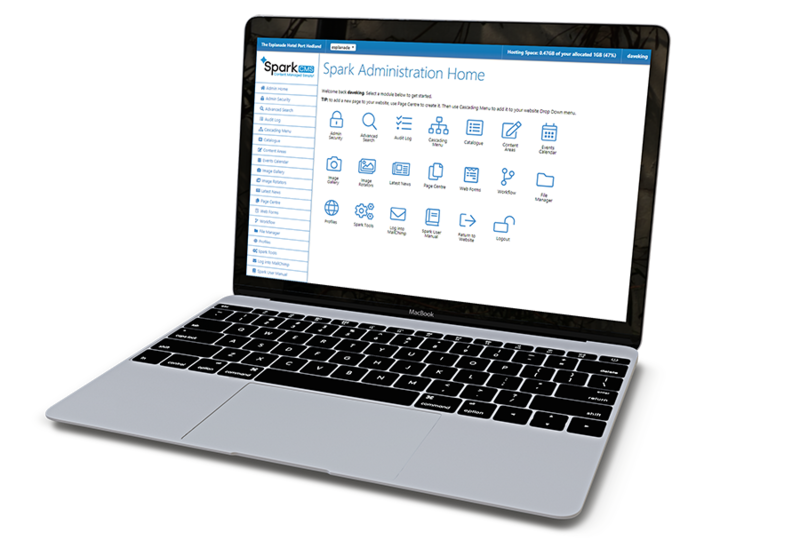 Create your own Spark CMS user logins for additional staff members to access and maintain your website. An audit log provides CMS Administrators a view of all changes to CMS content across all modules, detailing each change. This history also provides CMS administrators and editors the ability to recover a particular version of content. Various access levels are controlled through user permissions and module access. Desired workflow control can be implemented, allowing content to be reviewed before being published live. Create or update your own menu structure through the Cascading Menu module. This module gives full control over the website’s sitemap in an easy to understand tree view. Administrators can edit menu text, temporarily disable menu items, change order and choose from an automatically generated list of links to CMS content throughout the website. are accessible to those with visual impairment, including the ability to re-size fonts and increase colour contrast. integrate directly to the index ensuring new or updated content is made available through the search engine. Linked or documents (PDF, DOC, DOCX etc.) are also crawled and added to the search index. Manage, upload, rename and edit images and other media in one easy location. The built-in image editor includes tools for adjusting contrast, brightness, saturation, resizing and more. This feature can also be conveniently accessed from the Page Centre during page editing. Browse existing and build new webpages within this feature-packed and easy to use What You See Is What You Get (WYSIWYG) editor. The Page Centre provides all the formatting tools needed to style and build HTML web page content, including pre-made heading styles, bold and italics, font colours, font sizes, tables, lists, hyperlinks and uploading and inserting images and videos. Advanced website administrators can also choose to view and edit the page code directly. Quickly refresh your memory with a built-in online user manual. Request help from the Market Creations support team directly from within the CMS. Opt to have a weather feed appear on your home page, giving users more reason to return to your site. This basic version of the form builder provides a great way to interact with your users online. Create custom short URLs using the Website URL Manager. This module allows you to transform lengthy website URLs into short and succinct campaign URLs which can be easily added to your marketing collateral and shared via social media.